HONOLULU, April 12, 2019 – A $10,000 grant from Hawaiian Electric to the nonprofit Touch A Heart (TAH) helped support 12-week internships for Ginger Narawa and Thomas Dias, who graduate today from the Hoololi Food Services Program. Combining culinary skills training with practical knowledge, the program gave Narawa and Dias the tools and confidence to become employable. "Our goal is to transform lives by rebuilding the person," said Colin Kumabe, TAH director of operations. "Many of our interns are referred to us by social service agencies and are coming to us broken. They may be recovering from substance abuse or transitioning from incarceration back into the community. We provide on-the-job training, community connections and hope." "A big part of what we do is getting our interns job ready," said TAH Chef and Trainer Chad Haruguchi, who has been an instructor at TAH going on his second year. "We teach them about food safety, knife skills and kitchen etiquette in addition to cooking for groups as small as 10 and as large as 500. It's less training for the restaurants and hotels that hire our interns because they've already learned how to navigate a commercial kitchen through the internship." Hoololi, from the Hawaiian meaning "in the act/process of transformation," also provides soft skills training such as communication, friendliness and the importance of dependability. "I learned a lot," smiled Dias. "It wasn't only about cooking and working in a commercial kitchen, but I also learned how to be a good employee." The Aiea resident has come a long way from the days when a series of bad choices left him unable to support his family. Narawa, a single mom from Kalihi who also struggled with poor decisions in the past, said she gained invaluable lessons from working alongside the other interns as a team. 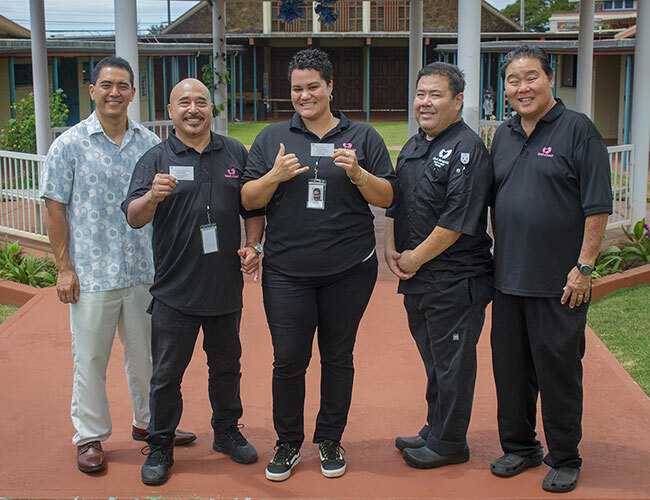 Both credit Haruguchi and the Touch A Heart staff for helping them earn their Food Handler's Education certification from the Hawaii Department of Health several weeks shy of their formal graduation from the Hoololi program. Dias graduates with a job lined up in the food service industry. Narawa is hoping to pursue a commercial driver's license while using her newfound culinary skills to cook for her family. To learn more about TAH or to donate to their mission, visit www.touchahearthawaii.org.